Be Present. Focus Inside. Relax the Breath. This past weekend, we held a Mantra Immersion. Taking a full day to do mantra practice is like soaking oneself in the most soothing and refreshing of inner baths. Meditation can be defined as a state of mind that is without thoughts, AND it is a mind that is at peace despite thoughts. Anita began her studies in yoga in 1999. In 2001, she became certified to teach hatha yoga in the Shambhava Yoga tradition. Since that time, she has become a Certified Shambhava Meditation Instructor and continues to practice and study meditation, yoga philosophy and hatha yoga in the Shambhava tradition. She has also had the privilege of learning from senior teachers of the Ashtanga, Viniyoga, and Anusara traditions of hatha yoga. 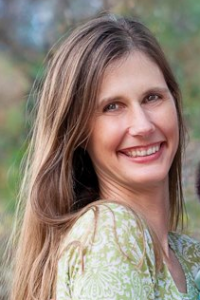 Anita is an experienced psychotherapist, student of Ayurveda, and mother to a preschooler. Her teaching style reflects her keen interest in how the ancient practices of yoga can help us to create emotional, mental, and physical balance, as well as spiritual transformation.